I bought this issue of BRAVE AND THE BOLD while my Mother was out doing household errands one day with the family. I know I got it in an unfamiliar candy store and that its selection was due as much to the limited offerings at hand as anything else. But I can recall flipping through it in the car. As I’ve relayed many times, by this point in my comic book collecting career, I had figured out that B&B featured somehow “off-brand” super-heroics. But the issue co-starred my second favorite hero, Green Lantern, so how bad could it really be? But Vakla isn’t convinced by the Lantern’s story about having become disenfranchised in his civilian identity. 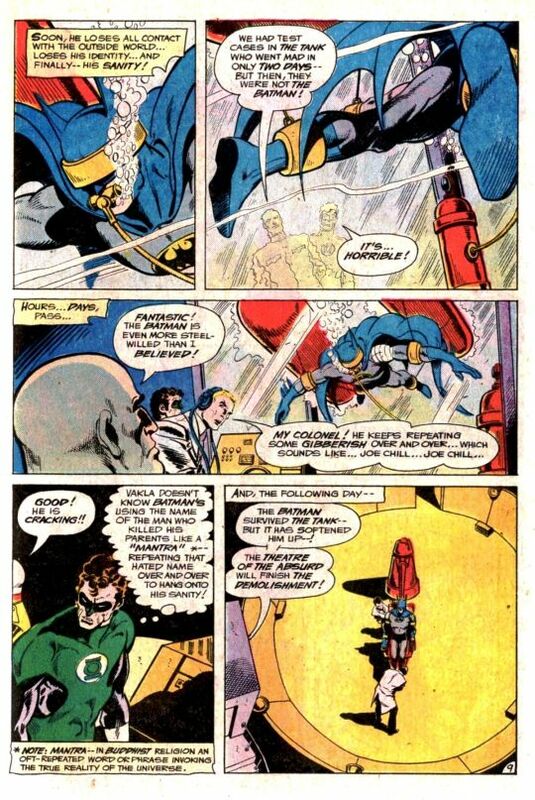 So he confiscates GL’s Power Ring (somehow) and orders the Emerald Crusader thrown into a holding cell. 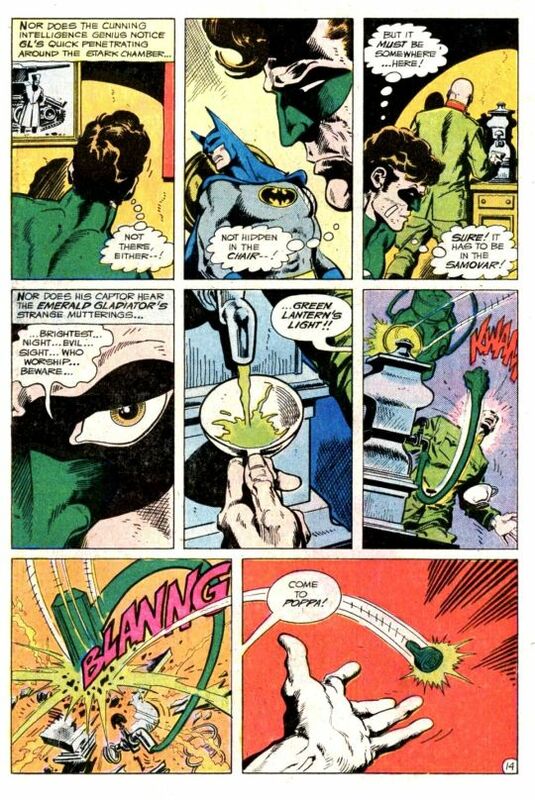 Meanwhile, as news of the Lantern’s defection spreads, in the U.S. Batman is recruited for a mission behind enemy lines: he’s to either retrieve Green Lantern and bring him back to the United States, or else kill him before he can disclose the military secrets that he knows to the communist regime. 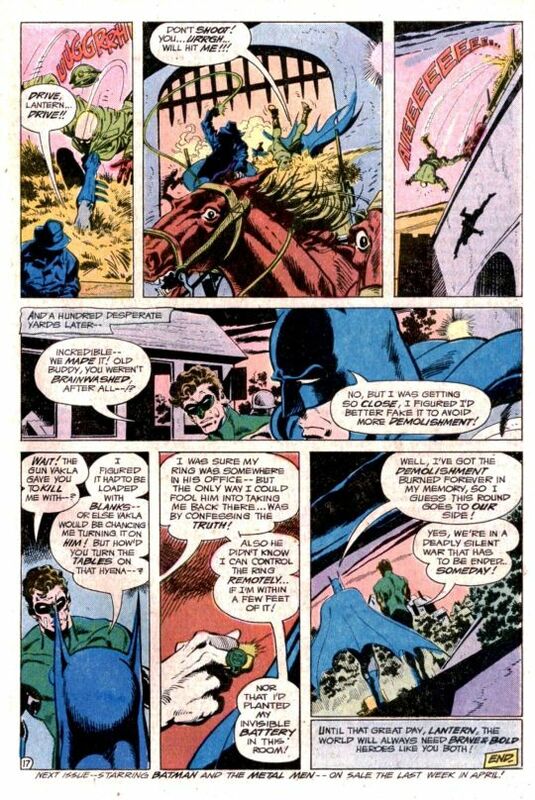 But Batman’s adventure behind the Iron Curtain fares no better than GL’s, and he is captured and brought to Vakla and the seemingly-broken Green Lantern. While the Emerald Warrior hasn’t given up crucial secrets yet, it seems like it’s only a matter of time. Because Vakla has perfected an advanced form of brainwashing he calls Demolishment–and now his intention is to break the Darknight Detective with it as well. For days, Batman is subjected to sensory deprivation, hallucinogenics, base-grade torture and other discomforts designed to wear down his resistance. 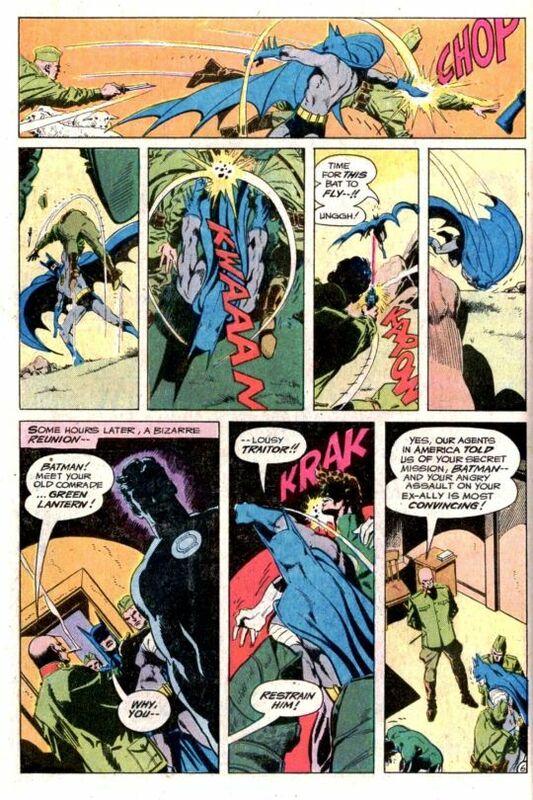 Ultimately, Vakla hands the broken manhunter a gun and orders him to kill Green Lantern–and Batman does indeed pull the trigger. Fortunately for GL, the gun is merely loaded with blanks. 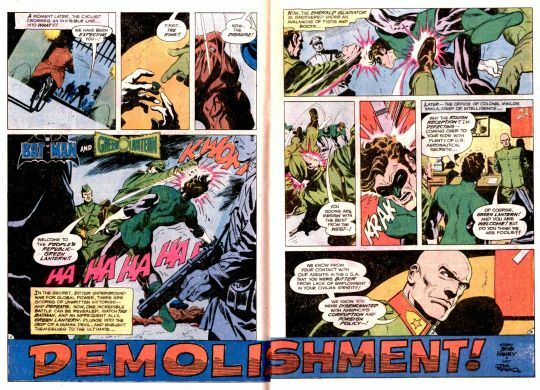 But seeing Batman in this condition causes Hal to make a confession of his own: his defection was a ruse, the real plan here was to find out what the Demolishment was and come up with a method of foiling it–something that Batman has seemingly failed to do. But during his confession to Vakla, Green Lantern is able to charge his ring remotely–he figured it must be hidden in Vakla’s office, and so he planted his invisible power battery there, recharging it remotely. And yes, none of this quite fits in with the established limitations on GL’s will power, but just roll with it. 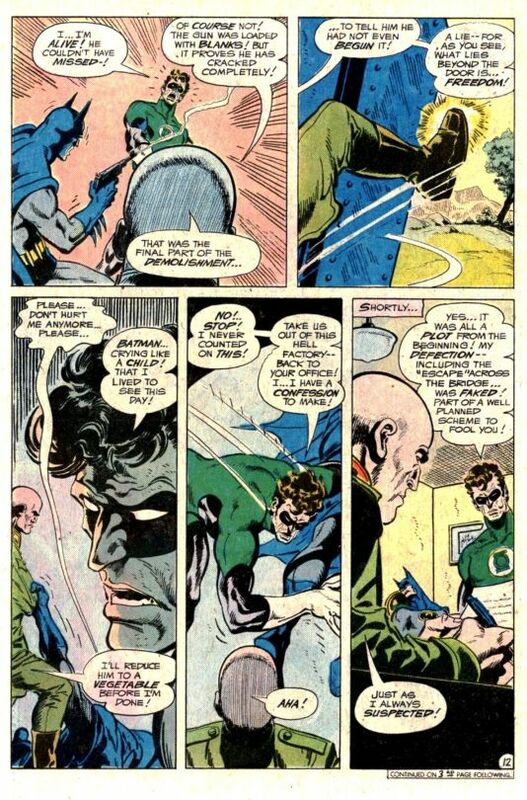 Aparo, at least, makes an interesting 8-panel page out of GL’s efforts, as shown above. With his Power Ring restored, Green Lantern scoops up Batman and the pair makes a run for the border. Once again, in order to make a contest of it, Green Lantern reveals that he’s too beaten up to make much use of his ring, and so run-ins with enemy jets almost finish our fleeing heroes. But the pair is able to disguise themselves in a wagon–and Batman comes to in time to grab a too-curious Vakla at the border as the pair make their final run to safety. Turns out Batman wasn’t really brainwashed, but he was getting so close that he figured the best way out was to pretend he had broken. And then, having really accomplished not much at all, our two triumphant heroes walk into the sunset. I’m not sure why writer Bob Haney thought that Green Lantern would be a good fit in a Cold War espionage story line this one–but there you are, that was the BRAVE AND THE BOLD pattern in a nutshell. 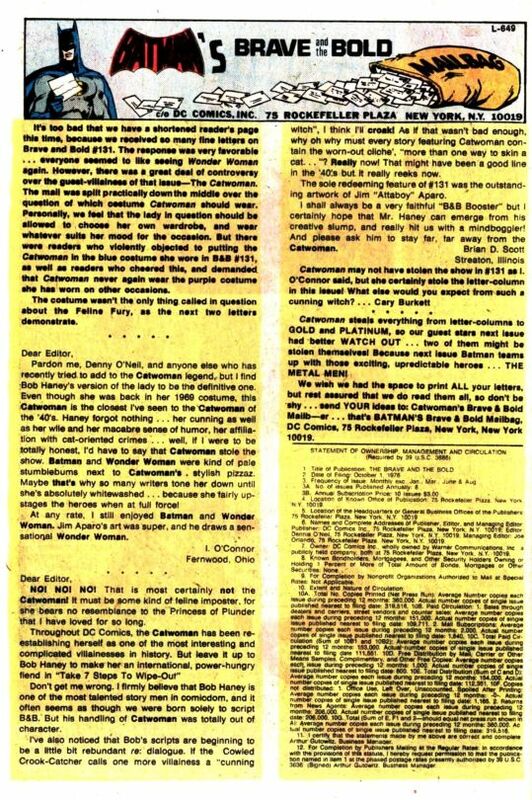 And once again, the letters page in this issue included the yearly Statement of Ownership, from which we can determine the general health of the series at this moment in time. Over the previous year, BRAVE AND THE BOLD had sold on average 154,000 copies per issue on a print run of 360,000, for an efficiency of just under 43%. Pretty typical for the DC books we’ve looked at this year so far.